Oh crap, Kuni might just be back... Listen to this info about Yoshi posted on Tekken Zaibatu. I am not sure yet if it is true or not. So far Yoshimitsu has gone under the most drastic change. Harada notes that it will be much more difficult to use Yoshimitsu this time around and they consider him an ?Expert? character. Part of his story includes the fact that his sword is now losing power and he must take a new fighting style, Kenjutsu from the Manji clan, this includes both dual sword fighting and pure fist fighting! Hold on a sec, didn't Kuni originally want Yoshi's sword because of the power the sword had? Now that the sword is losing power, what would be her motive of joining the tournament? To take the piss out of Yoshi or Bryan? At any rate, if Yoshi's gonna have multiple or no swords, I think there will be a draw sword / put sword back command for him. Or at least it would come in very handy. But this also could lead to think that Yoshi's power isn't actually his, but something that comes from the sword. Aww, shucks. I don't think I'm up for the idea. Kogamitsu : But this also could lead to think that Yoshi's power isn't actually his, but something that comes from the sword. In other news I'm loving this idea. I can imagine Yoshi with two primary stances like Ivy (swords sheathed, swords drawn) and possibly even a third in-between stance where he holds one sword with two hands or something. And according to which primary stance you're in you would be able to transition into his other stances. Imagine, only with "One-Sword-Drawn-Stance" is he able to execute the Flea/Pogo stance. what Yoshi powerless without his sword? no it can't be. you know what I can't be too sure if Kuni want's to be in the tournament more to kill Yoshi or get the so called lightsaber. 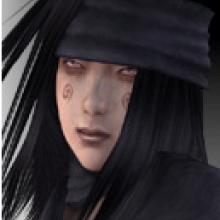 look I hate to go a bit off subject here but has anyone heard any news on Raven making apperance in tekken 6? and also what the main story is going to be? Kogamitsu : Hold on a sec, didn't Kuni originally want Yoshi's sword because of the power the sword had? Now that the sword is losing power, what would be her motive of joining the tournament? To take the piss out of Yoshi or Bryan? Actually no. The reason she wanted the sword in Tekken 2 was mainly for her grandfather. The actual official Japanese storyline was that she was going to steal it for him because he wanted to make a copy before he died. If Namco doesn?t just drop this storyline, she?d probably join to get revenge for both her grandfather and herself. I can only dream right now that this return will actually happen though. The animation in mid battle for that would look so cool I think. 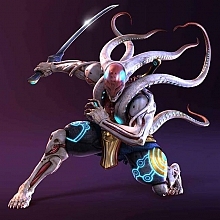 Anyway, I love the new Yoshimitsu idea either way. We are so used to seeing the proud, high and mighty Yoshimitsu of past Tekkens. I think it will be interesting to see him as he begins to fall from power thanks to Bryan. We?ve never really seen him in such a desperate situation. It makes sense to me. In every single release of tekken Yoshi has never been seen without his sword, never. So it doesn't take a genius to figure out that his power is either from the sword or amplified by the sword. So in saying his sword is losing power it makes sense that yoshi has to equip himself with new abillities. I actually like this idea, but double swords just sound kinda silly to me, even for namco's standards its a bit too much. Hey, if Bryan gets a gun, Yoshi can have two swords. That's all I'm saying. fastlegs : well hold on here. According to Raven's source, there will be an item move to everyone (ie. Anna throwing her high heels at her opponent, Bryan shooting with a shotgun...). if this is so this is going to change the way we play tekken, tekken will be in a new era of it's own. I think if this was to happen it will be used as a special throw move and that it will either be 1+3 or 2+4. "So far Yoshimitsu has gone under the most drastic change. Harada notes that it will be much more difficult to use Yoshimitsu this time around and they consider him an ?Expert? character. Part of his story includes the fact that his sword is now losing power and he must take a new fighting style, Kenjutsu from the Manji clan, this includes both dual sword fighting and pure fist fighting!" LOL LOOOL!!! LOOOOOOOL!!! What's that?! Who else thinks this "new info" is just crap? Where's the Arcadia scans??! Big chief steady on there how can tenshi porve anything if pictures have not been released. I said earlier, I didn't know if the information was true or not. There are no scans because they are being pretty secretive about things right now. That information was taken from an interview with the director and it was posted on quite a few credible sites. You can take it for what it's worth. Raven : I said earlier, I didn't know if the information was true or not. There are no scans because they are being pretty secretive about things right now. That information was taken from an interview with the director and it was posted on quite a few credible sites. You can take it for what it's worth. I thought the info was found in an Arcadia magazine (or Famitsu, I dunno). The director interview mentions other already known info, and apparently there's something about a new character nicknamed "Manly Man", but again I'll remain weary of this new info. Last time, we were all duped into thinking that Bruce and Dragunov had history to settle in T5: DR.